I have learned sometimes reading books for this blog becomes more like a job and not a hobby. Trudging through books both good and bad is sometimes tedious, but my purpose with starting this was to help inform other readers. For myself as a reader it is nice to have a change of pace when I find a book that is not making me think. Today’s book is one of those books that has some serious value to the average fan but is still not to taxing on the brain. 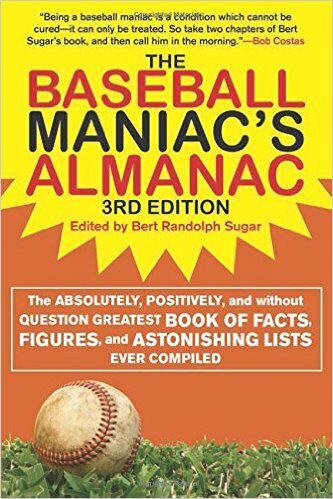 The Baseball Maniac’s Almanac is a handy tool for fans. It contains statistics and facts that are of interest to the average fan. Along with team statistics it shows overall stats for certain categories and eras. It will help fans increase their knowledge of the game’s history, along with being an entertaining read. It is very comprehensive in its coverage of the game’s history and allows the reader to cover a broad period of time in a very small package. Books like this are very interesting in an era where statistics rule the game of baseball. While this book is based on statistics, it is still the basic categories and formulas we all grew up with. Sabermetrics and the new way to analyze baseball has its place within the game, but so do the stats of yesteryear that are not in as much favor as they once were. Baseball fans should check this out, if nothing else you will have a good time with the memories that these statistics can generate. It may also generate a few spirited debates between you and your friends, and that might be worth the price of the book right there.